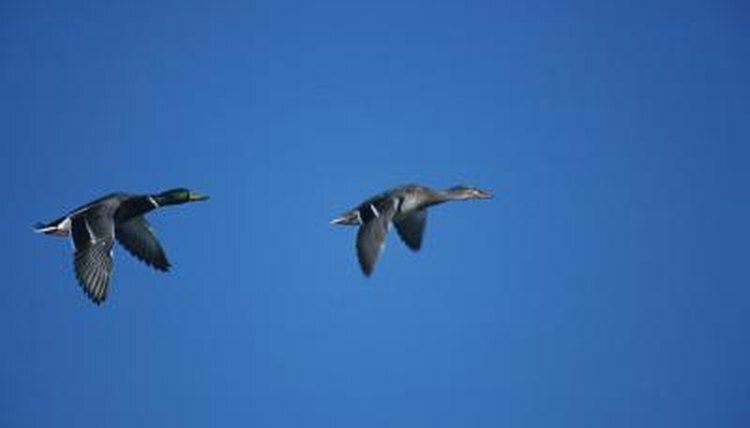 What Adaptations Help a Duck Migrate? Every year, ducks take to the skies and fly south for the winter. This allows them to escape the frigid temperatures and food scarcity in the north that they wouldn't be able to survive. Certain adaptations allow ducks to successfully complete their migration each year, first helping them reach a warmer climate and then returning home once temperatures climb again. Ducks adapted to notice the changing seasons and are particularly sensitive to changes in the photoperiod, or the amount of daylight they get each day. This adaptation tells them when to start preparing for their migration, accumulating body fat that will help fuel their bodies as they make the journey from north to south. When the average period of daylight has sufficiently dwindled, ducks leave their homes and start their migration -- if they were not adapted to know when to leave, they might not be out of range of cold weather before it strikes. Some make a journey of 800 miles in as little as eight hours -- a journey that takes as long as a week to recover from. By checking the position of the stars in the sky when flying at night, ducks ensure they are headed in the right direction. These birds consistently demonstrate an ability to navigate based on the position of the stars above, "reading" them like a road map in the sky. They are so reliant on navigating by the stars at night that on overcast nights, they may become temporarily disoriented when they lose sight of them. The magnetic field of the Earth is also instrumental in helping ducks successfully migrate. This notable biological adaptation is found in their beaks, where they have small amounts of magnetic iron oxide. This helps them align themselves with the Earth's magnetic field -- an adaptation so instrumental to their migration that in experiments, birds carrying magnets are unable to navigate following their typical visual cues, such as the sun. Ducks migrate north at the end of winter, and are adapted with keen memories that help them find their way back home. They observe landmarks such as rivers, mountains, highways, coastlines and more from the sky, remembering them for the journey back home. This allows some breeds, like canvasbacks, to return to their regular breeding sites with a success rate as high as 75 percent. How Does an Eagle Use Convection Currents?